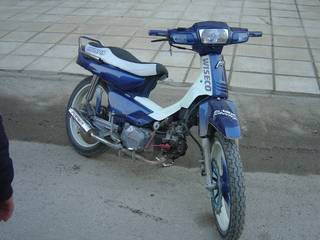 Honda Astrea Grand is a 100cc motorcycle generation of Honda's pretty tough. You could say as tough Supra X. 100cc Honda engine that was different from the Honda 100cc engine that now. More precisely the purpose of Astrea Grand saia and Supra X has performed better than the Fit X and Revo. For those of you who've tried the four motors are, of course know the difference. But that must be considered is the installation of the carburetor Yamaha RX 100 to release the original carburetor filters. No need to worry, bro n sis can adopt a variation of the carburetor filter brands. Do not let the motor without carburetor filters. Can damage the engine because of dust and dirt into the fuel. As a result, making the cylinder liner blisters. So do not forget to install the carburetor filter variations in Honda Astrea Grand carburetor after changing the RX 100. We apologize if not exactly the same cost. It estimates the cost of reply in Yogyakarta. In one of Castrol Bike Point. In addition the choice of carburetor filter variations affect the total cost of course.